Held annually, the NAA invites a leading architect, often a winner of a RIBA Gold Medal or the Stirling Prize, to talk about their work. 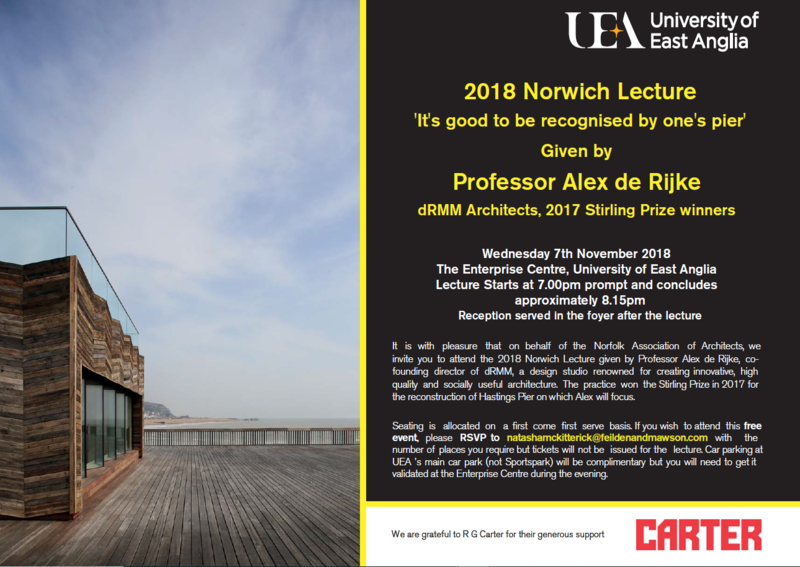 The Norwich Lecture takes place every Autumn at the University of East Anglia, most recently within the multi award winning Enterprise Centre. The location is apt, as the university has a long tradition of commissioning exciting high quality buildings and architecture. The 2018 lecture will be given by Professor Alex de Rijke, co-founding director of dRMM, a design studio renowned for creating innovative, high quality and socially useful architecture. The practice won the Stirling Prize in 2017 for the reconstruction of Hastings Pier on which Alex will focus. Seating is allocated on a first come first served basis so please RSVP. Tickets will not be issued for the event. Car parking is at the UEA’s main car park (not Sportspark) will be complementary but you will need to get your ticket validated at the Enterprise centre during the evening. The event will take place on Wednesday 7th November, starting at 7.00pm, at the Enterprise Centre and although attendance is free, places must be booked in advance. Contact Natasha McKitterick at Fielden + Mawson to book or for further information.